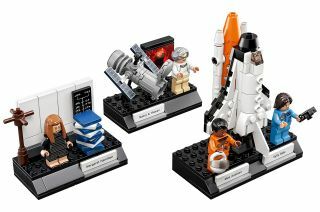 The Lego Ideas "Women of NASA" set includes minifigures modeled after astronomer Nancy Grace Roman, computer scientist Margaret Hamilton and astronauts Sally Ride and Mae Jemison. Four trailblazing figures from NASA's history are set to launch as new Lego minifigures on Nov. 1. NASA astronauts Sally Ride and Mae Jemison, astronomer Nancy Grace Roman and computer scientist Margaret Hamilton are celebrated for their contributions to space exploration and astronomy in the new Lego Ideas set, "Women of NASA." Based on a fan-proposed and supported design, the set includes representations of the four female space pioneers, as well as three Lego builds that recreate the spacecraft and settings where the women made their mark on space history. The 231-piece building toy is recommended for ages 10 and older. It will retail for $24.99. The women featured in Lego's "Women of NASA" set span the first five decades of the U.S. space agency's 60-year history. The real figures behind Lego’s “Women of NASA” minifigures (top left to bottom right): astron-omer Nancy Grace Roman, computer scientist Margaret Hamilton, and astronauts Sally Ride and Mae Jemison. Nancy Grace Roman, an accomplished astronomer, joined NASA in 1959, just one year after its founding, as the agency's first chief of astronomy. She is paired in the Lego set with a small posable model of the Hubble Space Telescope and a projected image of a planetary nebula. Roman is known to many as the "Mother of Hubble" for her role in planning in the venerable orbiting observatory. Hamilton's minifigure is matched with a build that recreates an iconic photo of her standing with a tower of her printed out Apollo Guidance Computer code. Ride was selected with NASA's 1978 astronaut class, the first to include women and minorities. In 1983, she became the first American woman to fly in space. She logged a total of two weeks orbiting Earth on two shuttle missions. In addition to her role as an astronaut, Ride was a physicist and advocate for science education, especially for young girls. Jemison, a physician and engineer, became the first African American woman to fly into space in 1992, logging nearly eight days aboard space shuttle Endeavour. An astronaut from 1987 through 1993, Jemison today leads the 100 Year Starship project, advancing the research needed for humanity to achieve interstellar travel within the course of a century. Ride's and Jemison's minifigures, which are dressed in the appropriate style flight and pressure suits they wore to launch into orbit, are accompanied by a 4-inch-tall (12-centimeter) model of the space shuttle on which they flew. Roman, now 92, Hamilton, 81, and Jemison, 60, are alive to see to their 1.5-inch-tall (4 cm) minifigure selves. Ride died in 2012 at the age of 61. The design of each Lego “Women of NASA” minifigure is based on iconic photographs of the four trailblazing women. Both the Sally Ride and Mae Jemison figures include the correct mis-sion patch for their first space shuttle flight (STS-7 for Ride in 1983 and STS-47 for Jemison in 1992). The "Women of NASA" set was chosen for production from the fan submitted and supported projects on the Lego Ideas website in February. Maia Weinstock, an editor, writer and producer of science and children's media, as well as the deputy editor at MIT News, the news outlet for the university, first proposed the set in July 2016. It took only two weeks for her project to achieve the 10,000 votes that were needed for a Lego production review. Weinstock's original proposal included a fifth figure honoring NASA mathematician Katherine Johnson, the "human computer" whose story was the basis for the 2016 movie, "Hidden Figures. "According to Lego, Johnson's figure was omitted after the company was unable to obtain approval for her inclusion. "We naturally fully respect this decision," a Lego spokesman told collectSPACE.com. The "Women in NASA" is the fourth Lego Ideas set to be released that is based on real space exploration history. Earlier models have included Japan's Hayabusa asteroid sample spacecraft, the Mars Curiosity rover and NASA's Apollo Saturn V moon rocket. Two more sets, a space shuttle and a launch tower for the Saturn V are now under review. See more photos of Lego's "Women of NASA" set to be released Nov. 1 at collectSPACE.